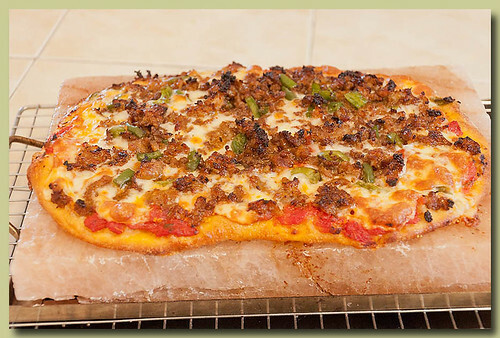 Ever since I bought my Himalayan salt block, I've been wondering how it would work as a pizza stone. 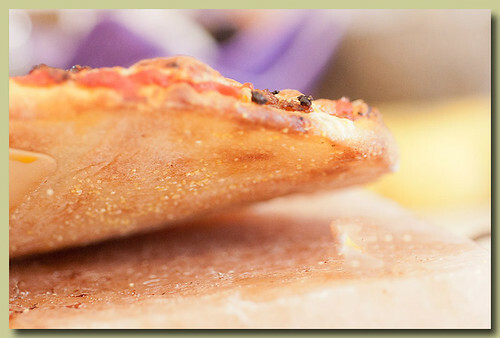 Today I satisfied that curiosity and discovered a fabulous pizza "stone." Hot out of the oven, still sizzling and bubbling. 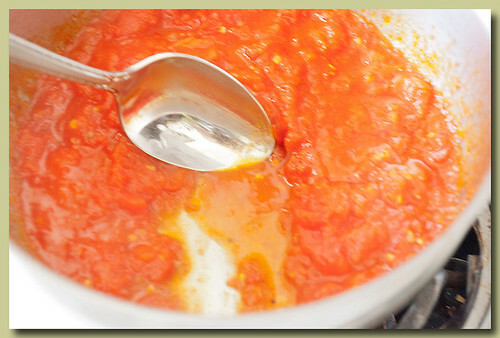 I had 6 roma tomatoes that have seen better days, so I blanched them quickly in boiling water, peeled and seeded them. Once peeled and seeded I put them in a saucepan to simmer and reduce. I also added some garlic, Italian seasoning and red pepper flakes while they were simmering. I usually have some pizza dough in the freezer, so all I had to do was defrost one of them and roll it out. Look at those beautiful yeasty bubbles, the dough was full of them, beeeeautiful. Since my slab is 12X8" I rolled out the dough to about 11-1/2 X 7-1/2"
Place the dough on a pizza peel, or rimless cookie sheet sprinkled with cornmeal, before adding toppings. 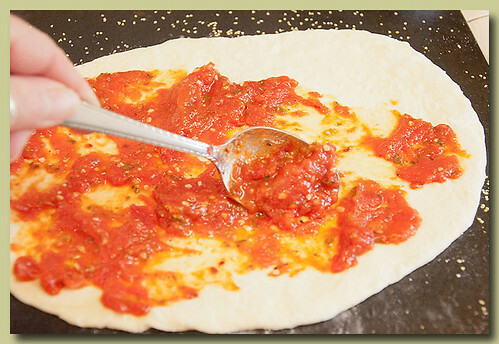 Spread the tomato sauce, or your favorite pizza sauce over the dough. Put your favorite toppings on the sauce. 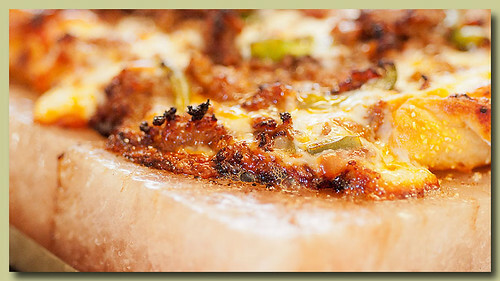 I used Mozzarella cheese and a mixture of cooked spicy Italian sausage and green bell peppers. 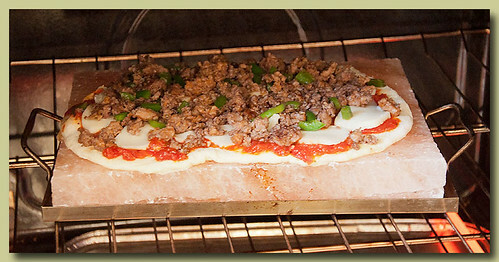 Put the Himalayan salt slab in a cold oven. 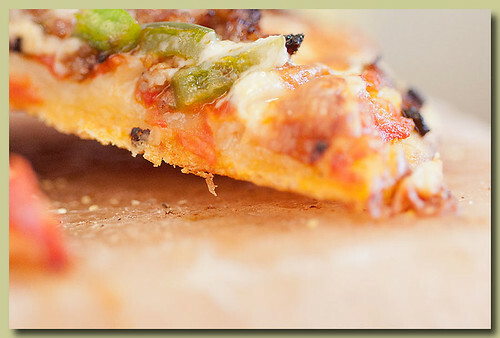 Crank up the oven to 500*f. When the oven comes up to temp, slide the pizza onto the slab. Hot out of the oven. I couldn't wait to peek at the crust, it's a beautiful golden, crunchy, crust. 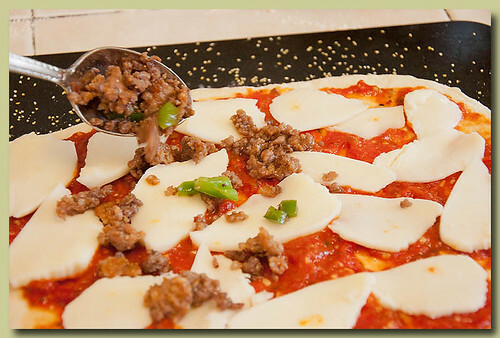 This was my favorite part of the pizza, the bit of cheese that oozed off the crust onto the slab and became a crispy, cheesy, cooks treat. I could hear the pizza still sizzling as it came out of the oven. 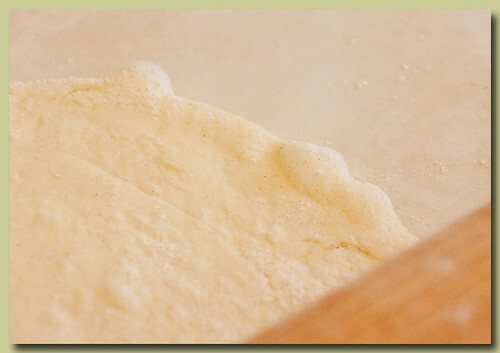 I've used this pizza crust recipe several times and it hasn't failed me yet, and it's so easy. pot lid or plastic wrap/cling film. a towel and allow to stand for about 15 minutes. MAKES 2 PIZZAS Make the dough at least 3 hours before you need to bake it. you weigh all the ingredients.